*3 Piece Set Dimensions: 1 Bath Mat: 1 Bath Mat (31.5"x19.5")+ 1 Round carpets (R21.5"). 1 lid cover (16"x19.5") Note: This Lid Cover Rug works for Round Toilet Lid. 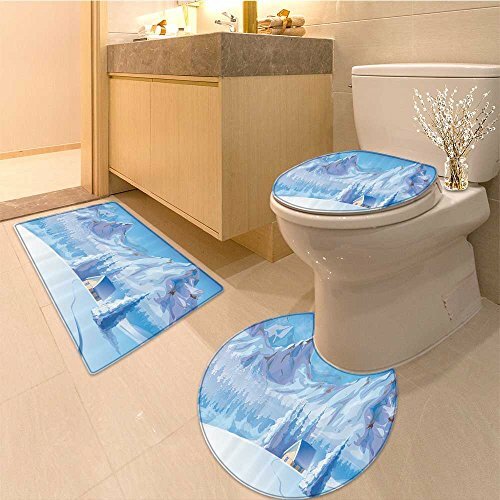 3 Piece Bath Mat Set included: 1 Bath Mat: 1 Bath Mat (31.5"x19.5")+ 1 Contour Rug (R21.5")+ 1 lid cover (16"x19.5") Note: This Lid Cover Rug works for Round Toilet Lid.